SINGCHUNG, India — “Follow the rustling in the bushes,” whispers Phurpa Tsering, tiptoeing aside. I hear a brief low-pitched call. A bird, larger than a sparrow but smaller than a pigeon, stirs in the branches before diving deeper into another bush in the ravine. Its partner trails behind, revealing a fleeting glimpse of the bird’s famed olive-gray body and black cap. Tsering, a self-taught and highly sought-after local bird guide in Eaglenest Wildlife Sanctuary, a protected area in India’s northeastern-most state of Arunachal Pradesh, had pointed me to an extremely rare bird. The Bugun liocichla, or Liocichla bugunorum, is a critically endangered species, with only 14 to 20 individuals believed to exist in the world. Nearly all of the birds live within a tiny area just outside the sanctuary — with one pair having been spotted inside the sanctuary several years ago — sharing their home, and name, with a local indigenous tribe. The Buguns, sometimes known as the Khowa, are clearly proud of the Bugun liocichla: it was one of the first bird species to be discovered in India since the country’s independence in 1947 and it lives only on the Buguns’ community lands. “Lots of researchers name species after someone else’s name, but we were very happy that the bird was named after the tribe,” says Indi Glow, the Bugun head of a bird tourism enterprise close to the sanctuary. Formally described in 2006, the bird brought fame to the small tribe of around 1,500 Buguns. India even launched a 25-rupee postage stamp, a face value of about 30 U.S. cents, featuring the Bugun liocichla in 2012. More importantly, the bird’s discovery kick-started a cascade of conservation activities, culminating in the declaration of a brand-new community reserve in 2017 — one that is already winning awards. 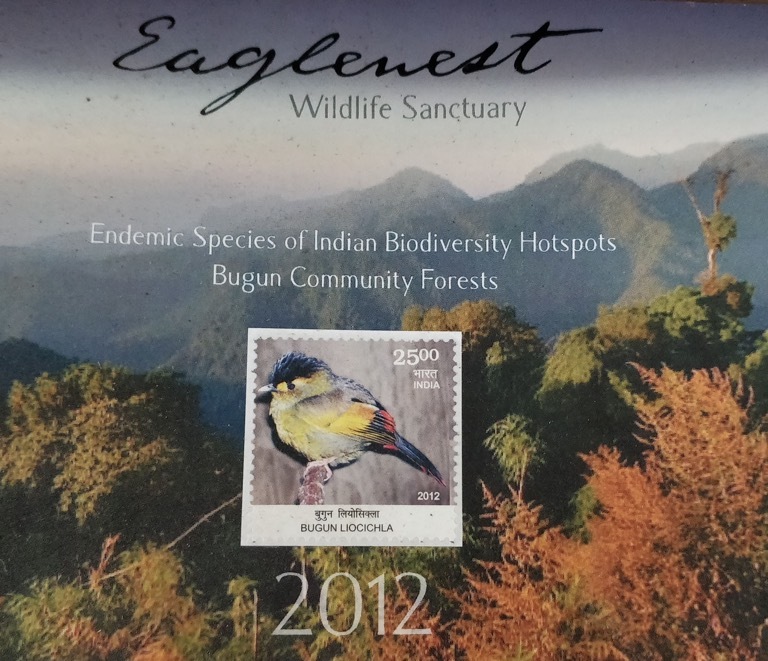 Postal stamp featuring the Bugun liocichla released in 2012. Image by Shreya Dasgupta/Mongabay. It all started with a simple quest. In January 1995, Ramana Athreya, then a professional astronomer doing his Ph.D., was accompanying his wife, a wildlife biologist doing research in Arunachal Pradesh, during a monthlong vacation. 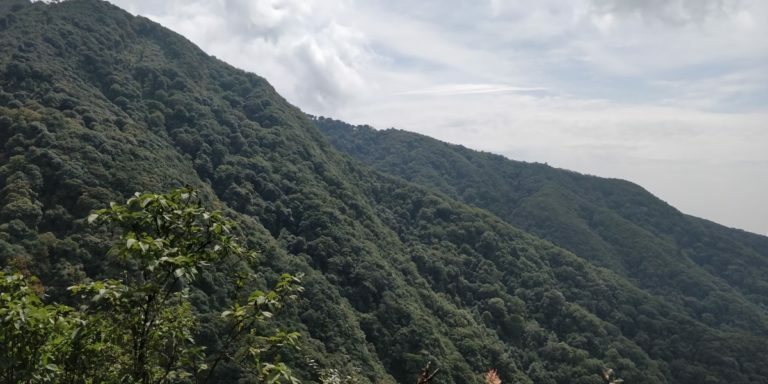 An avid birdwatcher, Athreya was eager to explore the state while he was on holiday, and some forest officers pointed him to the recently established Eaglenest Wildlife Sanctuary. There, while birdwatching, he spotted a pair of birds that didn’t fit any description in the bird book he was carrying. But it wasn’t just the birds that caught Athreya’s eye. He was stunned by the range of diversity the forest offered: everything from lowland tropical rainforests at an elevation of 100 meters (330 feet) to temperate conifer forests at 3,200 meters (10,500 feet), each with its own unique wildlife, packed inside in a single park. To top it all, the entire altitudinal range was accessible via a single road, unpaved but drivable, running through the forest. Eaglenest Wildlife Sanctuary covers a range of altitude from 100 meters to up to 3,200 meters. Image by Shreya Dasgupta/Mongabay. “I thought that was a spectacular situation; there aren’t many places [where] you can do that,” Athreya tells me in his office at the Indian Institute of Science Education and Research (IISER) in Pune, Maharashtra state. These days, Athreya is an associate professor, splitting his academic duties between astrophysics and ecology research. Back then, however, Athreya was focused on astronomy. After finishing his Ph.D., he went to France, then Chile, for postdoctoral research projects, using his time in South America to also go on birding trips. It was on these trips that he saw the potential of community ecotourism. There was a lot of money to be made from tourism, which could be routed to conservation, he realized. But the community-tourism models he’d witnessed had some problems: most enterprises were actually controlled by private city-based operators, while local personnel did all the lower-level jobs. “It wasn’t being managed by the community, and I didn’t think this was right,” Athreya says. With this in mind, Athreya returned to Eaglenest in 2003. 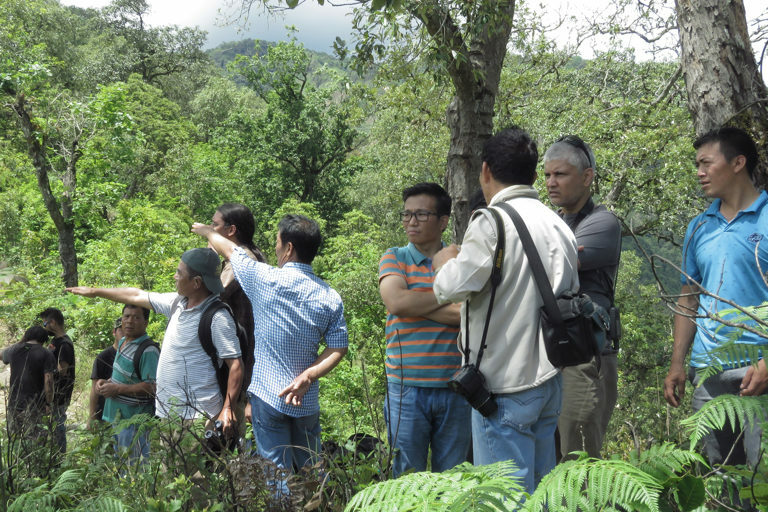 The forests surrounding Eaglenest Wildlife Sanctuary, located in the Himalayan foothills of West Kameng district, are legally owned by the Arunachal Pradesh Forest Department. But as is the case in much of northeast India, the indigenous tribes living around Eaglenest claim de facto ownership of most forests falling outside formally designated protected areas, relying on customary rights and traditional boundaries to demarcate land between and within tribes. A number of tribes, including the Buguns, govern the land around Eaglenest. There’s no estimate of the extent of this area, though. And the forest department typically refrains from interfering. 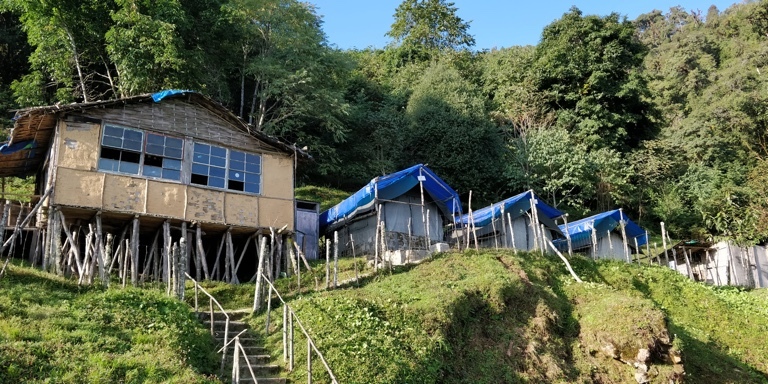 Athreya wanted to launch a community ecotourism project on Bugun-owned forest land. This, he felt, would ensure a socioeconomically secure community in the long run, one that would benefit from protecting Eaglenest and surrounding areas. In a meeting in Singchung, the main village of the Buguns, Athreya laid out his plan: he would help the Buguns set up a commercial bird tourism enterprise that would be completely community-run. The enterprise, Athreya hoped, would show the Buguns that conservation could be a profit-generating business. But before that, he would need to spend some time documenting the region’s biodiversity, the attractions that would bring in the tourists. Singchung is the main village of the Bugun community near Eaglenest in Arunachal Pradesh. Image by Shreya Dasgupta/Mongabay. The Buguns were skeptical. They wanted proof that people would be willing to spend money to see birds. In 2004, Athreya handed Indi Glow the evidence, in the form of three international tourists whose birdwatching visit to the area generated around 20,000 rupees (then $400) in profit for the community. Surprised, but also pleased, Glow agreed to run the enterprise. The Buguns divide their community land among individual members. Glow used a piece of his land — called Lama Camp because the Dalai Lama’s entourage once stopped for a night there while fleeing from Tibet in 1959 — to set up basic tourism infrastructure. 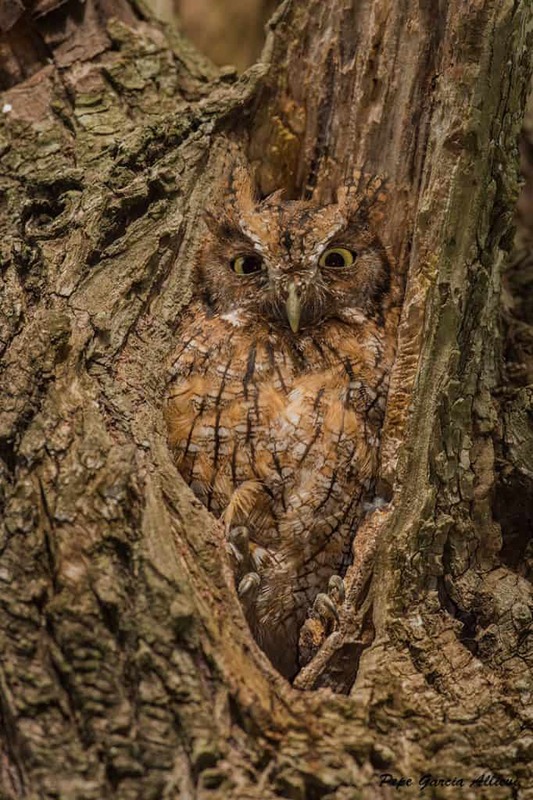 Meanwhile, a band of volunteer naturalists mapped the area’s birds, amphibians, reptiles and butterflies, taking detailed notes, high-resolution photographs, and recordings of calls. This meticulous inventory of the area’s natural history would be the bird tourism enterprise’s unique selling point. In 2006, Athreya accomplished a feat he’d been trying to achieve since his first trip to Eaglenest more than a decade earlier: He netted the same species of bird he’d seen but failed to identify in 1995. Using photographs of the captured bird, a few feathers, and calls recorded over the past few years, Athreya formally described it as a new species, the Bugun liocichla, that same year. The discovery, in fact, instantly catapulted the bird, the Buguns, and the forests around Eaglenest into the international spotlight. That same year, Athreya and Indi Glow rolled out the bird tourism enterprise, investing money that Athreya had obtained through various grants. The investment, in both infrastructure and knowledge, paid off. Fourteen years later, the enterprise, now run entirely by Glow and his staff from nearby villages, continues to turn a profit, with annual revenue of around 5 million rupees (about $69,000). The bird tourism business also generates employment and other business opportunities for people living in nearby areas. “I think we laid the foundation of making conservation community friendly,” Athreya says. Lama Camp, a Bugun-run bird tourism venture near Eaglenest Wildlife Sanctuary. Image by Shreya Dasgupta/Mongabay. Sange Norbu Phiang, a Bugun schoolteacher who lives in Singchung, agrees. The liocichla’s discovery, in particular, prompted conversations around conservation. The area in and around Eaglenest has had a long history of intensive human activity. Large-scale logging was rampant once, but the Supreme Court of India banned it in 1996. The Buguns also clear forests on their community land to farm, and they collect firewood, medicinal plants and other non-timber forest products. But since the early 2000s, the community has been discussing ways to protect the forests on their land, Phiang tells me at his house, part of which doubles as a noodle-making operation. The Buguns have been especially careful about cutting trees around Lama Camp, where most of the liocichla pairs live. The community has also largely refrained from expanding their farms too close to the camp. Some have even abandoned farms near Lama Camp, though primarily to avoid crop-raiding elephants. 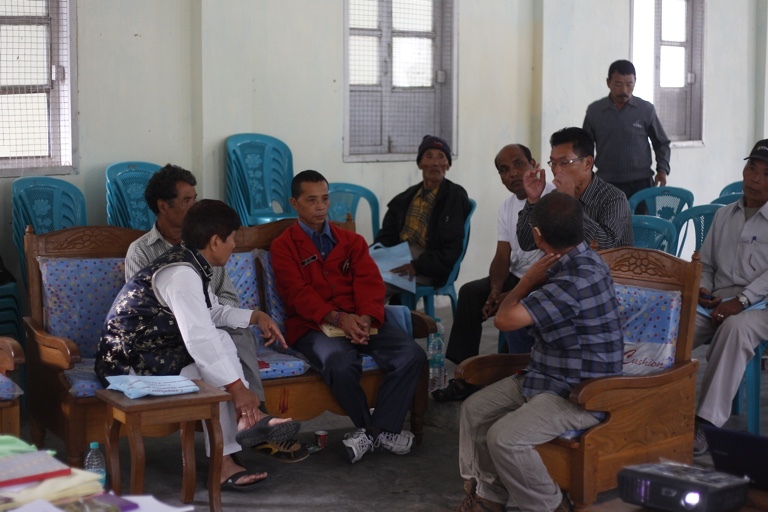 Some Bugun community members in discussion. Image by Rohan Pandit. Researchers remain unsure why the liocichla survives in such extremely low numbers, but everyone wants to make sure it continues to do so. 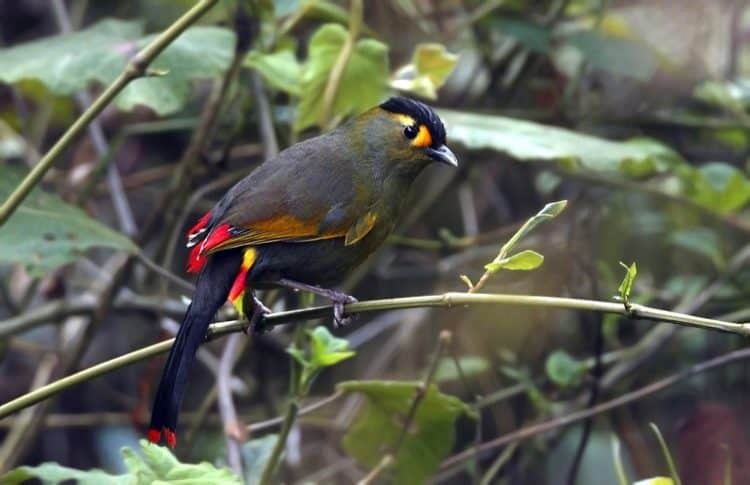 In 2013, the idea to protect the Bugun liocichla’s home took a more definitive shape. 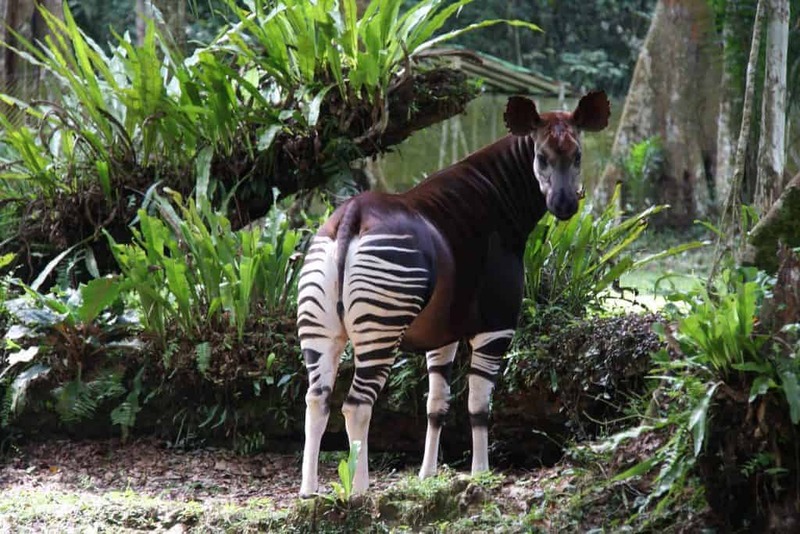 It was spearheaded by Millo Tasser, a new forest officer who’d been put in charge of the area in late 2012, and researchers like Umesh Srinivasan and Nandini Velho who, like Athreya, had spent several years studying the region’s wildlife. Velho and her colleagues, for instance, found that the community forests surrounding Eaglenest were teeming with mammals, including very rare ones. There was the mysterious red panda (Ailurus fulgens), for example. Then there were Asiatic wild dogs (Cuon alpinus), Himalayan black bears (Ursus thibetanus), Asian elephants (Elephas maximus), and yellow-throated martens (Martes flavigula). There were also three elusive small cat species: the golden cat (Catopuma temminckii), marbled cat (Pardofelis marmorata) and leopard cat (Prionailurus bengalensis). In addition, the forests harbored severely threatened plants, such as the minangmose tree (Gymnocladus assamicus), Fairrie’s lady slipper orchid (Paphiopedilum fairrieanum), and the Himalayan yew (Taxus wallichiana). “These data showed that the forest right outside Eaglenest was equally important. The forest also had the same kinds of animals and birds that are inside the sanctuary,” Tasser tells me at Ramalingam, a second tourist camp that Indi Glow owns. These revelations prompted the idea of a community reserve, land that would be accorded legal protection under India’s Wildlife Protection Act of 1972, just like a national park or a wildlife sanctuary. It’s unclear who first came up with the idea, but in 2013, Tasser, the researchers and Indi Glow held a meeting with other Buguns in Singchung to discuss the reserve’s possibility. As with the bird tourism idea, many Buguns were skeptical at first. “They had the misconception that once an area is declared a community reserve, the land lapses to the state government, that the land is no longer under their control, which was a fair thing, I thought,” Srinivasan tells me at Ramalingam camp, in between calls from local people asking him to prescribe cures for sick relatives. Srinivasan is a trained medical doctor and also a postdoctoral student in ecology at Princeton University. He’s been studying birds at Eaglenest Wildlife Sanctuary for more than a decade. At the meeting five years ago, he, Tasser and Indi Glow put forward their case for the community reserve. The land, which hosted the liocichla and several other rare species, would continue to be governed by the Buguns, they explained. The only thing that would change is that now it would be managed to ensure the protection of the wildlife and their habitat. “And eventually, most people agreed,” Glow says. What tipped the balance in the reserve’s favor was that the watershed of the river that the Buguns rely on lay in the heart of the proposed community reserve. Singchung is downstream of the watershed, and the community knew that the forest higher up was critical to preventing disastrous floods and landslides. “If we cut that forest, our stream that we depend on will dry up, so it was a good idea to protect it,” says Khandu Glow, a Bugun who recently retired from the Indian army and lives in Singchung. He brings out a printed Google map showing the community reserve, adjoining both Eaglenest Wildlife Sanctuary and Sessa Orchid Sanctuary. Finalizing the reserve boundary, he says, required detailed mapping and many discussions. Members of the Bugun community mapped the potential community reserve boundary along with researchers and the local forest officer. Image by Tallo Anthony. In between daily chores and other village activities, some of the Buguns trekked through their community forests alongside researchers and forest department staff, mapping what they thought they could permanently give up for the community reserve. Where there was no set trail or path, the Buguns relied on their memories, often hacking their way through dense, overgrown vegetation. The researchers then overlaid the GPS tracks on a map and showed it to community members who’d been unable to join the boundary-marking teams. In January 2017, the government of Arunachal Pradesh declared the Buguns’ agreed-upon area as the Singchung Bugun Village Community Reserve. 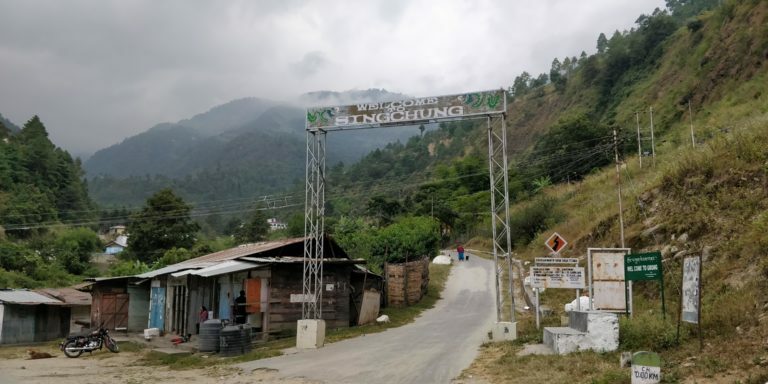 With this, a part of the Bugun land — formerly unclassified state forest that the government could have reclaimed at any moment — has been protected in perpetuity for the community, says Sange Norbu Phiang. 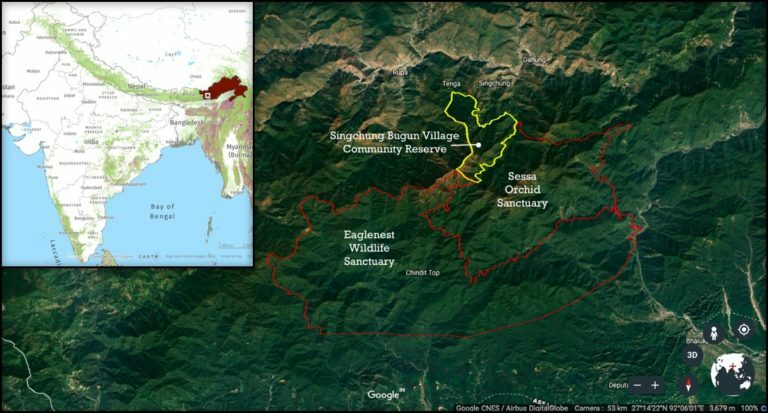 The Singchung Bugun Village Community Reserve (in yellow) lies adjacent to Eaglenest Wildlife Sanctuary and Sessa Orchid Sanctuary in Arunachal Pradesh. Map by Shreya Dasgupta/Mongabay. One of the community reserve’s best features is its patrol team. While hunting of wild animals included in the Schedules of the Wildlife Protection Act is banned by law in India, most tribes in northeastern India consider it a traditional way of life, albeit with diverse taboos and restrictions. The Buguns, too, have traditionally hunted. But the practice has declined considerably over the years, especially since the Dalai Lama’s visit to Singchung in 1997, when he encouraged the people to stop hunting animals. The reduction in hunting is also partly driven by the spread of cable television and the loss of traditional hunting knowledge, and in some parts because of conservation efforts, Srinivasan says. Most hunting on the Buguns’ community land today is carried out by neighboring tribes and non-Arunachali people, the Buguns tell me. 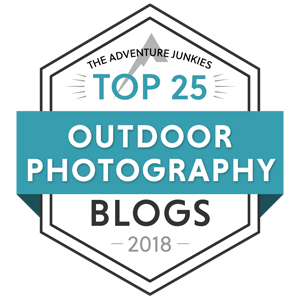 But some young Buguns hunt occasionally for recreation, as became clear when Tasser, Srinivasan and Athreya set out to interview potential candidates for the patrol team in 2017. Today, eight hand-picked young Bugun men, ages 24 to 34, patrol the reserve. Tasser says they’re in the process of recruiting some Bugun women to the team. Previously hesitant, the Bugun community is slowly opening up to the idea of young women working in the forests. A team of 8 Bugun men patrol the community reserve every day. Image by Shreya Dasgupta/Mongabay. Trained by the Special Task Force of the Tamil Nadu state police, and dressed in smart, camouflage-patterned uniforms with their names embroidered over their right breast pocket, the patrol staff head out into the reserve every day. 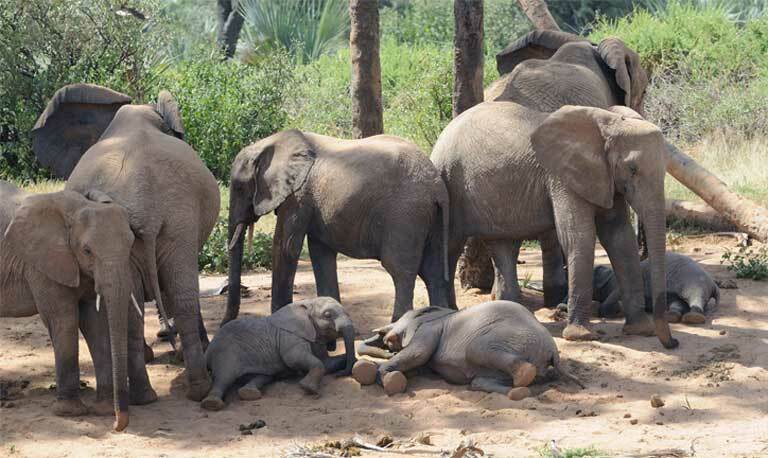 The reserve’s management committee has banned hunting and non-forestry activities, such as collection of firewood, medicinal plants and wild fruits, inside the reserve. So the “CR boys,” as the community calls them, log their routes and watch for signs of human activity. The team patrols not just the reserve, but also areas outside the official boundaries, covering nearly 40 square kilometers. In fact, the community reserve is now more effectively patrolled than any part of Eaglenest Wildlife Sanctuary: Tasser has only four forest department staff for the sanctuary’s entire 217 square kilometers (84 square miles). 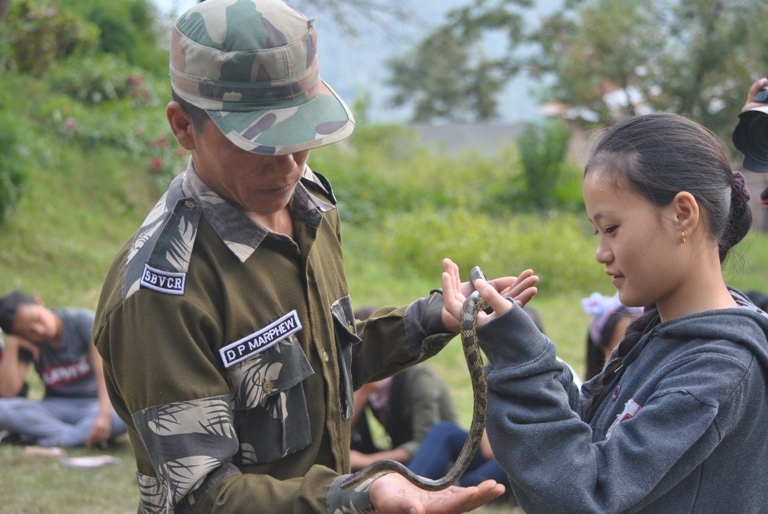 Two of the Bugun patrol staff have even been trained in snake handling. They now regularly rescue snakes from the villages and participate in local snake-awareness events. The Bugun community seems motivated by the boys’ employment. “Like our boys who have been employed now, there could be more such employment opportunities in the future,” says Sange Norbu Phiang, currently the secretary of the management committee. The community reserve patrolling staff was trained by the Special Task Force of the Tamil Nadu state police. Image by Millo Tasser. The reserve, including the patrol team and patrol-related infrastructure, is currently being funded by grants from the Rainforest Trust, a U.S.-based nonprofit environmental organization. 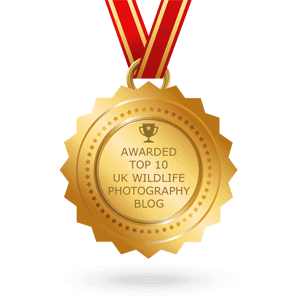 A few other organizations, such as the Wildlife Trust of India, have contributed GPS devices and provisions for the patrol team. The forest department steps in when funds fall short, Srinivasan says. 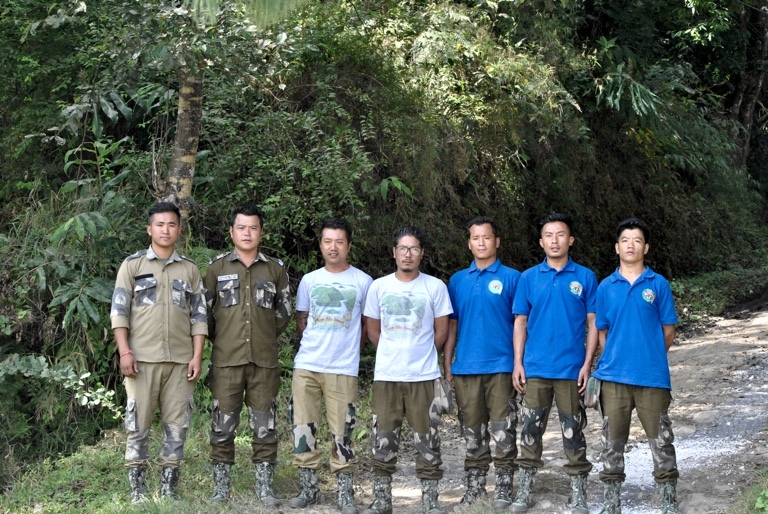 In fact, Tasser, despite his varied and exhaustive responsibilities as the Divisional Forest Officer (DFO), has remained involved in the reserve’s functioning every step of the way. Right from supervising the recent construction of a patrol-team-manned checkpost at the reserve’s entrance, and even choosing its wall colors, to managing the patrol team’s work and filing the members’ income tax returns, Tasser does it all. Tasser says he knows he could be transferred to a different place soon. But he doesn’t see that as a barrier. “I remain positive that the person who is going to come after me would be better than me,” he says with a wide smile. This year, the Singchung Bugun Village Community Reserve received the India Biodiversity Award from the Indian government and United Nations Development Programme. The award comes with a 100,000 rupee ($1,400) prize and honors “outstanding models of biodiversity conservation, sustainable use and governance at the grassroots level.” The community had earlier received a 500,000 rupee ($7,000) award from the Arunachal state government for having the “best conserved community forests”. Left: New patrol-team-manned checkpost for the community reserve. 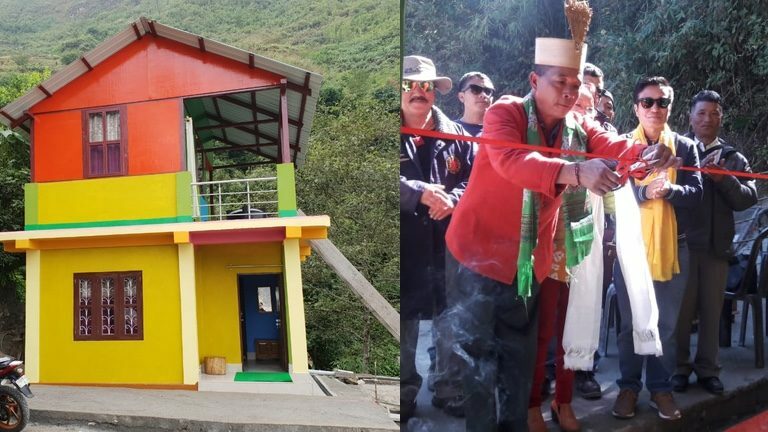 Right: Dawa Sarai, the Singchung village head, inaugurating the new checkpost. Image courtesy of Umesh Srinivasan. Still, Tasser’s outsize influence on the reserve’s function has some members of the management committee on edge. The committee has nine Bugun members on its governing council, including two women. Athreya, Srinivasan, Indi Glow and a few others serve as advising members, while Tasser, by virtue of being the DFO, is an ex-officio member. Dawa Sarai, the Singchung village head, or gaonbura, echoes the sentiment. These concerns, while seemingly minor at the moment, could shape the Buguns’ support for the reserve in the future. A handful of community members, including Indi Glow, as well as Srinivasan and Tasser, for example, hope to expand the reserve to the 40 square kilometers they initially envisioned. But the wider Bugun community will take more convincing. The Bugun community reserve is very rich in biodiversity. Image by Shreya Dasgupta/Mongabay. To achieve this, the researchers hope to create a system in which the community will take center stage in the reserve’s management, while others step back. Someone from the Bugun community will, for example, coordinate patrolling in the near future, while the patrol staff themselves will adopt streamlined data-entry methods to increase efficiency and reduce dependence on the forest department. Tasser and Srinivasan are in the process of writing a management plan for the community reserve. 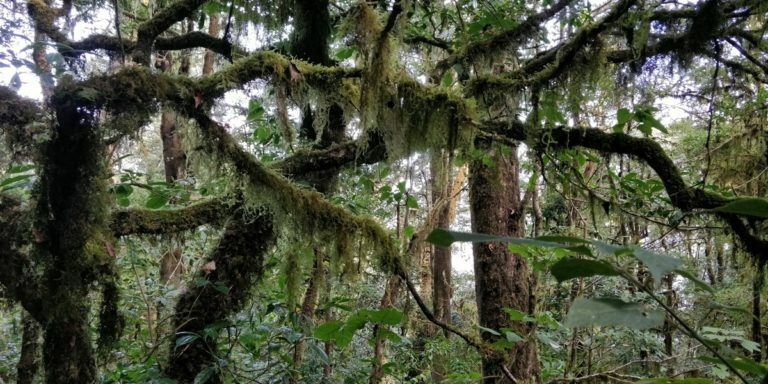 A formal plan submitted to the government, they say, will ensure that the government provides funding to run the reserve after the Rainforest Trust money runs out in five years. Athreya, however, is concerned that government funding alone might not be enough. Both Tasser and he think that expanding tourism activities beyond birdwatching to other nature-based activities, like treks or cycle rides through the villages and community reserve, could bring in additional revenue, perhaps hundreds of thousands of dollars annually, sustaining the community reserve for a long time. At present, though, the community reserve shows promise. Despite some of his criticisms, Khandu Glow, too, is optimistic about the future of the community reserve. As for the incredibly rare Bugun liocichlas, the same few pairs continue to be spotted, their home now under the protection of the new community reserve. And even if the species were to become extinct in the future, it’s legacy would live on. The community reserve patrolling team also conducts snake awareness programs locally. Image by Shreya Dasgupta/Mongabay. This article by Shreya Dasgupta was first published by Mongabay.com on 13 Dec 2018.